Stacy Piper, a seventh grade math and science teacher at Dominion Middle School, was one of several grant winners from Clintonville Go Public. “Want to see something cool?” Matt Hysell asks, popping his head into a classroom. He’s marching down the hallway almost before I can answer. Hysell teaches seventh grade language arts and social studies at Dominion Middle School in Clintonville. 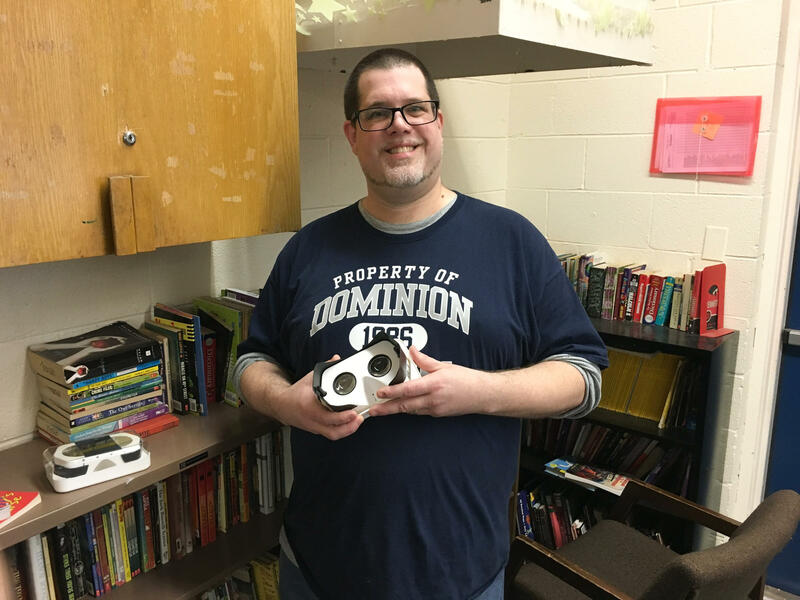 He actually went to Dominion himself—“I have been a Blue Devil since I was about 12 years old,” he says—and when it comes to the school’s new set of smart phone VR goggles, you can tell. It’s hard to say who’s more excited: him or the students. “They’re looking at whales,” he says with a wide grin, as a handful of students laugh on the other side of the room. Hysell’s original idea was to give students a chance to see the places they’re studying in his Ancient to Medieval History classes. But already they’re looking for additional uses. These students, for instance, aren’t in a history class—they’re in pre-engineering. Dominion received the VR headsets thanks to Clintonville Go Public, a local nonprofit that encourages parents in the Clintonville area to keep their kids in neighborhood schools. 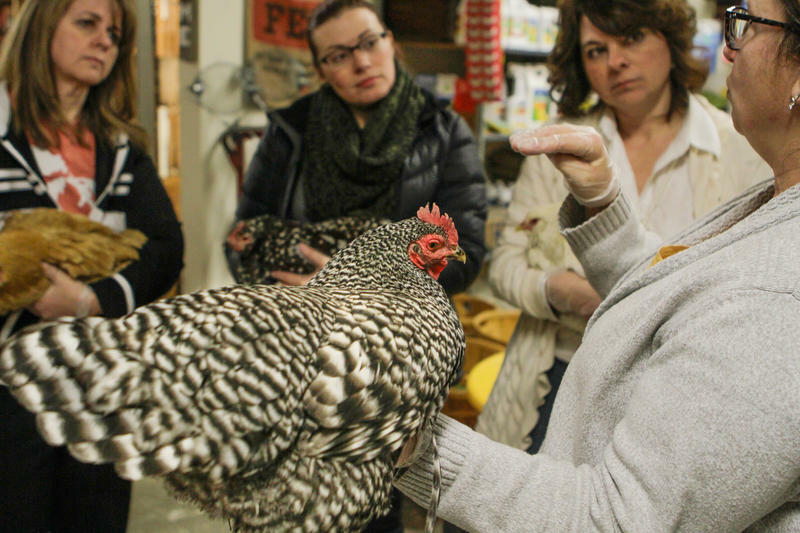 “We support the Whetstone pathway in a couple of different ways, and one avenue that we focus a lot of our energy on is fundraising,” said Tasha Weaver, head of Clintonville Go Public. Weaver’s organization has raised almost $100,000 since its inception to help pay for classroom materials, beautification projects and scholarships for students who couldn’t otherwise afford to attend an eighth grade Washington D.C. field trip. 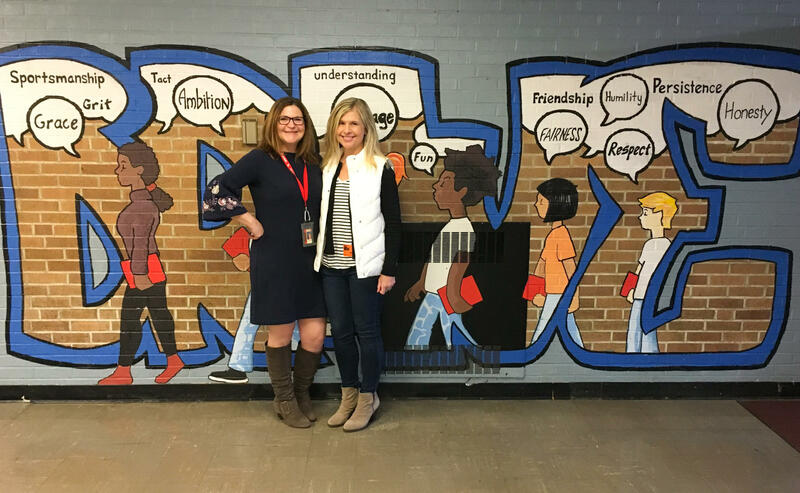 Dominion Middle School principal Dotty Flanagan (left) with Clintonville Go Public director Tasha Weaver, in front of a mural paid for by the organization. Those efforts center on the Whetstone pathway—a group of six elementary schools and Dominion Middle School, which all feed into Whetstone High. As students get older, enrollment in the elementary schools steadily declines. But then in middle school, enrollment falls off a cliff. Over the past 10 years, pathway elementary schools averaged a combined fifth grade enrollment of about 300 students. By sixth grade, it’s just 186 students. 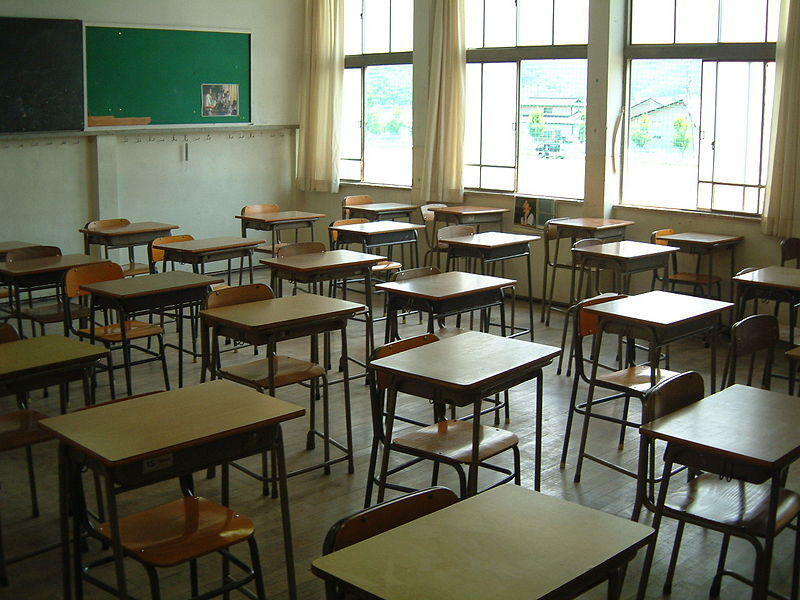 Headcounts spike again in ninth grade, but decline with each successive year. Columbus City Schools spokesman Scott Varner recognizes the pattern. He says there are many reasons for the dip—some parents move, others might choose a private school or another public school in a different part of town. Still others could decide a specialized charter program is best. Weaver says it’s great parents have so many options on the table, but she wants them to know their kids can be just as successful at the school down the street. That’s where Clintonville Go Public outreach efforts come in. Teacher Matt Hysell with a pair of VR goggles that he purchased with a grant from Clintonville Go Public. In their first set of grants, Clintonville Go Public provided a new digital camera for animation projects at Whetstone High School and a set of math games to for kindergartners at Weinland Park Elementary. 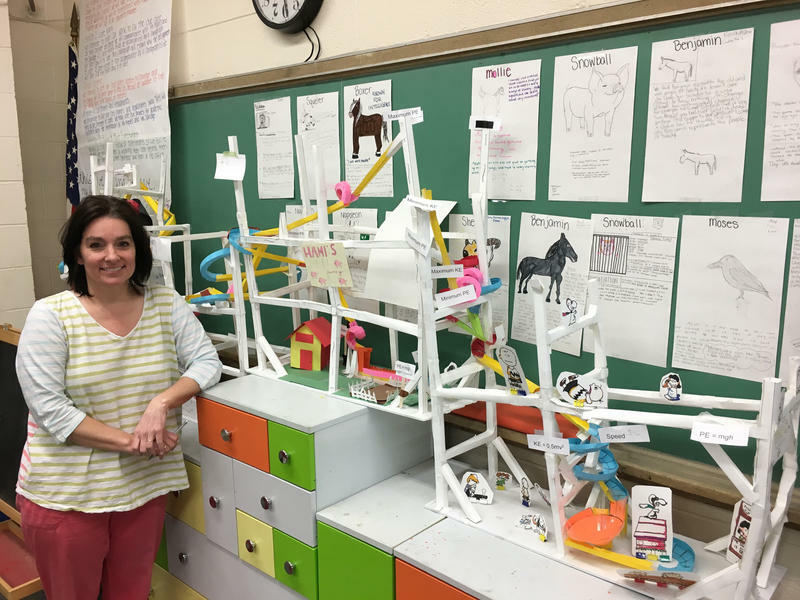 Stacy Piper teaches seventh grade math and science at Dominion, and with her winning proposal, Clintonville Go Public bought a handful or unique desks. “I compare them to a pear on its side with the top chopped off,” Piper explains. Because of the shape, the desks can fit neatly into different arrangements for group projects. For some projects, students are juggling a laptop, a circuit board and a notebook, and Piper says a little extra real estate goes a long way. Meanwhile, Dominion’s principal Dotty Flanagan is already thinking in terms of students’ employability, and she says putting them in a variety of groups helps build skills they’ll need in the workforce. “For us in four, five and six years, we know that those soft skills that there’s no curriculum for—collaboration, communication, organization, planning, self-regulation—are huge,” she says. The Columbus City School board on Tuesday night voted down a last-minute motion to restart its search process for a new superintendent. 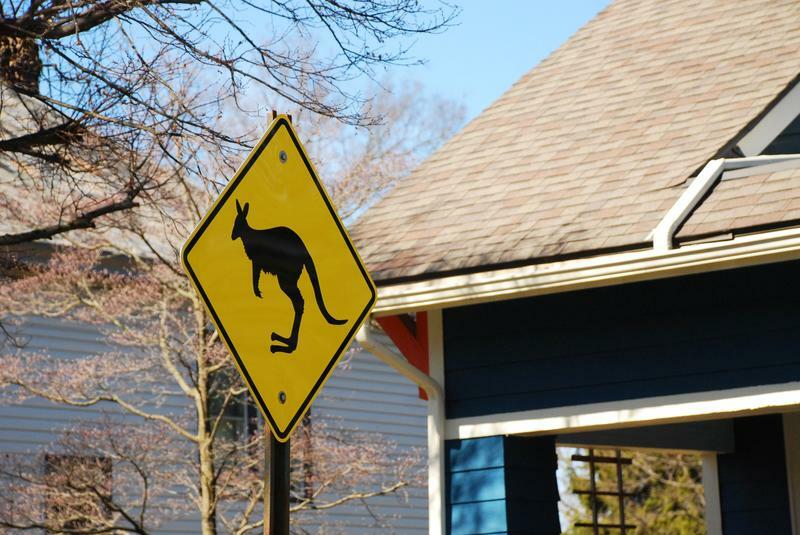 Residents of Clintonville are outraged. The reason? 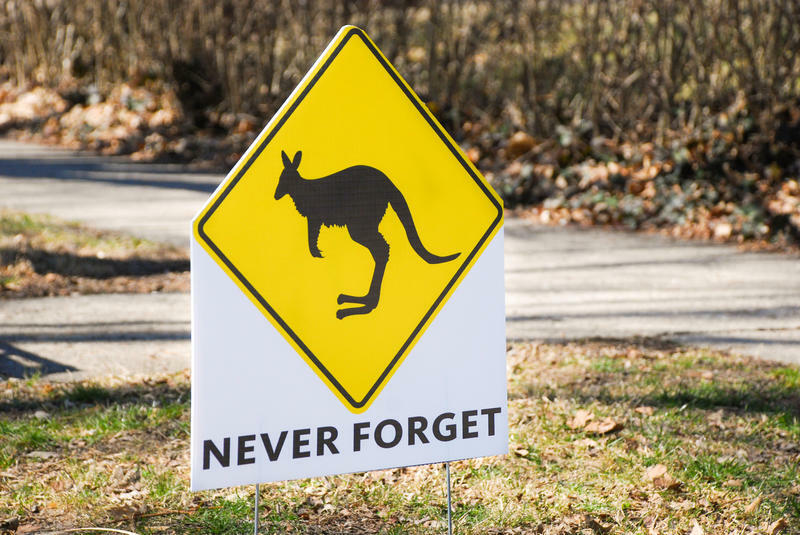 Their beloved “Kangaroo Crossing” sign is gone. 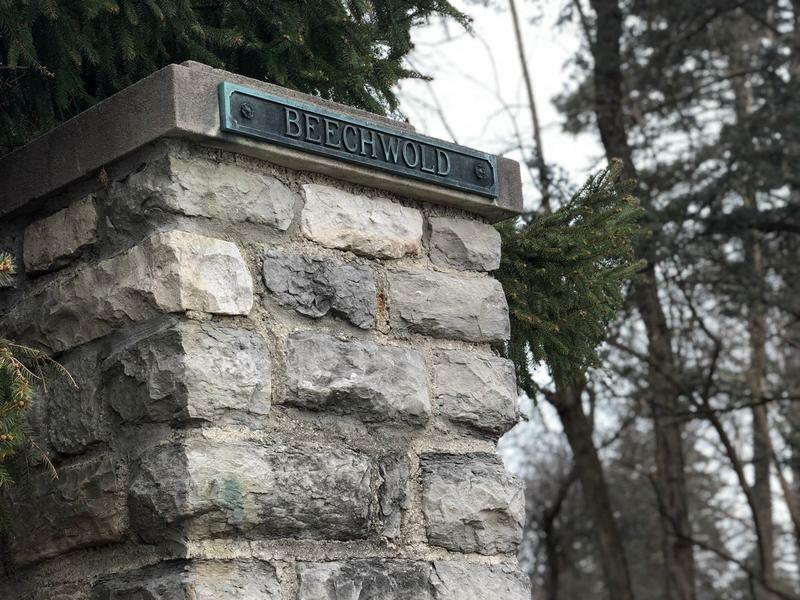 Curious Cbus: What's The History Of Old Beechwold? Haley Vest used to live on the corner of Indianola and Morse Road in Clintonville. But she would occasionally explore other areas—like the picturesque Old Beechwold neighborhood.